Cage diving with Great White Sharks has to be one of the coolest animal adventures on the planet. While the visibility was low the day I went, I was lucky enough (if you can call it that) to come face to face with the jaws of one of these massive creatures while holding my breath underwater. That's right, no snorkels were used, and my fingers and face were mere inches from its grinding teeth. We held our breath, ducked underwater, and waited to be scared straight out of our bathing suits. I lucked out by snapping this photo of a Great White Shark from the boat. 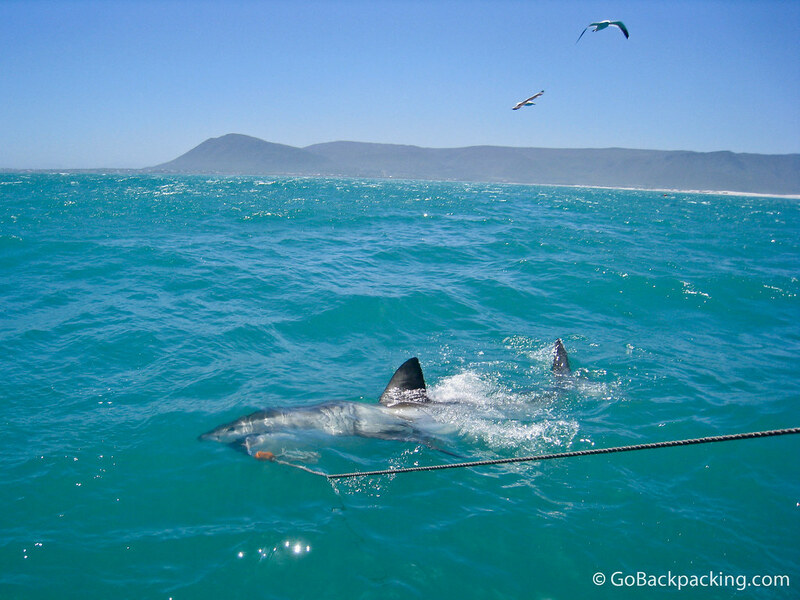 A Great White Shark off the coast of Gansbaai, South Africa takes the bait as we prepare to begin our cage dives off the boat. Oh, that’s so cool! Cage diving with the great whites is definitely something we’ve always wanted to do. There’s actually an operator for cage diving here in the Bay Area but sighting is not guaranteed (and I don’t think they put out baits to attract the sharks) so we’re going to wait until we get to South Africa to splurge on this experience. It’s worth the wait — I first heard about it when I was in French Polynesia. Two American girls had done it, and I knew then that I was going to visit South Africa (if only to see the sharks). i was wondering how about your feeling when you do the cage diving? wooo, i’m sure the adrenaline was pumped out.. AWESOME! That is a crazy adventure! What a really cool pic Dave! Thanks! It was really difficult to take photos from the boat as it was swaying back and forth on the open water, and of course you don’t want to fall into the water where giant sharks are being fed! At one point I climbed up on the roof observation area, and with a lower center of gravity, I was holding on for life (picture this: tourist gets ejected off the top of a boat, and eaten by Jaws). Great picture! Would love to give this a try some time. Joanna — it’s a lot of fun, and only cost me about $100 when I was there in 2008. By my standards, the cost to excitement ratio was outstanding!